We’ve eliminated your need to shop from dealership to dealership and endure hours of research and haggling. Our advanced market analysis software constantly audits the competition and we update our website daily to reflect the rock-bottom price. and will join our growing family of highly-satisfied customers. BMW of West St Louis is where drivers from Manchester go for their next new or used BMW Model – Proudly serving St Louis, Wildwood and Chesterfield. What are some of the new BMW models you’ll find at BMW of West St Louis? The BMW 3 Series, BMW 5 Series, BMW M Series, BMW X3 and BMW X5, to name a few. As for which ones stand out among the others: that’s up to you to decide. Here, it’s all about what suits you best. That’s why we encourage you to keep an open mind and evaluate all of your options – many of which, we’re proud to say, have earned at least one award or accolade. Interested in the time-tested value of a pre-owned vehicle? BMW of West St Louis has an incredible selection of used cars available here in Manchester. Our reliable array of vehicles spans across several auto brands, so you’re sure to find a pre-owned vehicle that perfectly suits your needs. Finding your ideal vehicle is the first half of the car buying equation. The second half is securing a car loan or lease that fits your current financial requirements. That’s something the team at BMW of West St Louis is trained to provide, and they do so by sitting down with you, one-on-one. That way, we can learn more about the kind of payment you’re comfortable with, your long-term financial goals and address any other questions or concerns on your mind. Once you are the proud owner of a BMW 3 Series, BMW 4 Series, BMW 5 Series, 7 Series, BMW M Series, BMW X1, BMW X3, BMW X5, or BMW X6, BMW of West St Louis wants to help you keep that new car as safe, efficient, and well maintained as possible. Our factory trained staff are pleased to provide you with onsite car service and repair. We utilize the latest automotive car care technology, and exclusively use only official BMW parts for any vehicle repair, or upgrade. 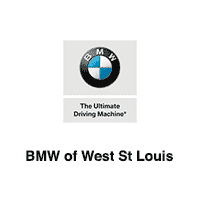 BMW of West St Louis is committed to making sure you have a fantastic BMW experience. No matter what model you’re interested in, new or used, we invite you to visit our dealership today. We’d relish the opportunity to get to know you and help you find a vehicle you’ll truly love, so be sure to visit us at 14417 Manchester Rd. in Manchester, MO, today.